I'm trying to find the original Hickory Farms "Christmas Blend" coffee, too. I ordered their Christmas Celebration thinking that they probably changed the name, but it isn't anything like the Christmas Blend that I remember. The original had a nice touch of cinnamon, and other subtle flavors that made it a great flavored coffee. The Christmas Celebration is a non-flavored coffee. Does anyone know where I can find a "taste alike" coffee to Christmas Blend? 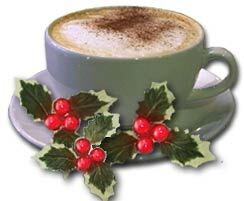 i am trying to locate Christmas blend coffee from Hickory Farms. Can't find. Can anyone help? Coffeemate makes an eggnog liquid creamer. It is wonderful but only available aroung Thanksgiving and Christmas. I just stock up. I still have some from Christmas. Hey there, found you by way of Dubious Wonder's Carnival. I'll be trying the coffee recipe! I bought a "Wintry Blend" coffee at Trader Joe's a couple of weeks ago, but the flavor is really heavy in peppercorns, gak, it's a smallish gak, but gak all the same. Also, I got a Chai-eggnog-latte at Starbucks, the flavor was pretty good. Look carefully at your eggnog container -- not all eggnog is made with milk. The non-dairy versions have a lot of scary unpronouncable stuff in them, and they tend to be overly sweet, but they might work very well as a non-dairy eggnog creamer. Heheh, you won't regret it, D! But you can do this with a drip coffee maker too. You just need to allow the spices to interact sufficiently with the hot water ... not just a chat, but a good long conversation ... so that the flavors come forward. Merry merry!